Several gladiators are called to aid in an attempt to overthrow a queen (Scilla Gabel) who protects the common people from the wrath of the nobles. 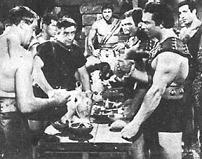 But Maciste (Mark Forest) comes to the rescue to prevent this. Also with Dan Vadis. Dan Vadis was to die under strange circumstances. On June 11th, 1987, in Lancaster, California, he was found dead in an automobile out in the desert. His death, apparently due to an accidental drug overdose, resulting from acute ethanol and heroin-morphine intoxication. He was survived by his wife Sharon Jessup.